What are those black roof stains? 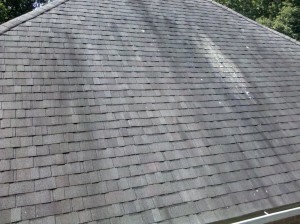 The black stains on your roof is a type of algae called Gleocaps Magma. It is always most noticeable on the north facing side of your home or business. It grows and gets thicker, blacker, and spreads to other areas of the roof. We have even seen it grow into a type of moss. Unfortunately there are not any household products that can remove it.